Joystick (from your brother’s video game) Manual Flight Control. Car Battery (from your mom’s car) Electrical Systems Power. Vacuum Cleaner (from the kitchen, heavily modified) Ion Propulsion Unit (with carpet height adjustment). 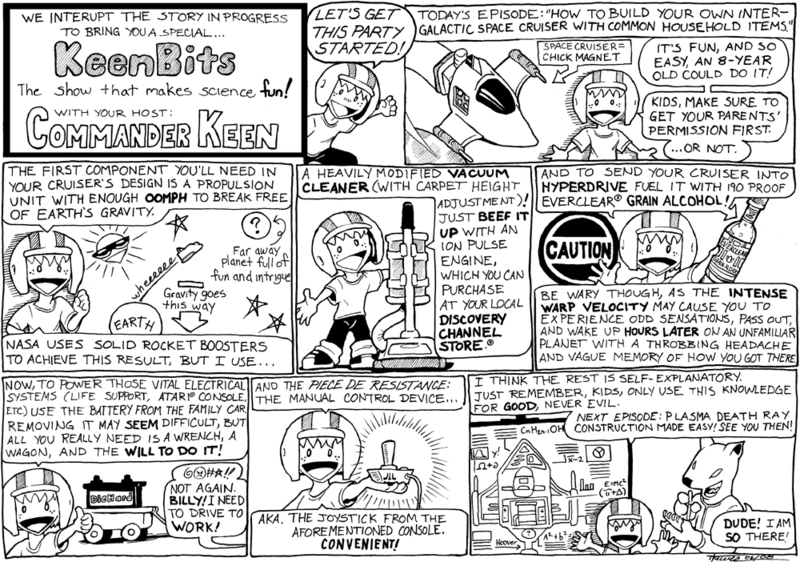 “KeenBits” is an obscure reference to an old kids’ science show that aired on Saturday mornings back in the ’80’s — but only around the Detroit, MI area — called “KidBits”.. It was something like “Bill Nye the Science Guy” only with less personality and much less budget. When trying to come up with a name for this Keen segment, that show popped into my head… So that’s where I got the title from. Hey I have all those parts at home!!! Next stop, Jupiter! And I’m eagerly awaiting the next installment. Please holdyourself up in your dark and dreary basement to complete the next oen toute suite! !